You must be able to swim 50 meters in light clothing. You must be have experience of basic kayak strokes, capsize drill and assisted rescues. These skills can be obtained through the pool sessions. When you sign up for a trip be honest about your experience and ability to the trip organiser. Over estimating your ability can lead to problems! If a trlp leader discovers that you do not have sufficient experience or ability to safely take part on a trip, then you will not be allowed to do so. If you have any existing health issues which may affect your ability to safely take part in a club organised activity and which are not already declared on your membership form then let the trip organiser know. If you are do not feel well, are too tired, have an injury or do not feel like taking part in the paddle then make sure that the trip organiser/leader/more experienced paddler is aware of your condition. You must be properly clothed and equipped. The trip leader/organiser or one of the more experienced members will help check that you are properly clothed for the conditions. Make sure that all the equipment is in good condition, fits you, and is correctly adjusted. If in doubt then ask a more experienced paddler for advice. If you develop or become aware of any problems with your kit during the paddle, then let the organiser/leader/more experienced paddler know about the issue, (e.g. broken or lost paddle, footrest failure). You will not be charged for damage or breakages to club kit, (unless intentional!). If the club is aware of any kit related problems then they can be addressed either during the trip or later on by the kit officer. You will be paddling as part of a group and you must stay within the group. 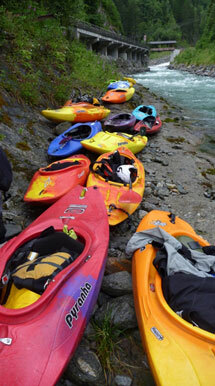 You must obey all the instructions of the trip leader and from more experienced paddlers for your own safety. The group may be organised in a variety of ways: buddy partners, small groups with leaders or one big group. Inexperienced paddlers will be mixed with more experienced paddlers who can lead, coach and provide safety cover at the required level. Sometimes a group may be split and you may find yourself temporarily separated from your group, (e.g. in small group on a river and the more experienced paddler may have to assist recover a swimmer or boat and thereby leave the group). In a situation such as this you must stay where you are, (i.e. in an eddy or on the bank), until either the more experienced paddler returns to the group or directs you from downstream to re-join the group. A trip leader may decide that the conditions are not suitable for your level of ability or experience. For example, heavy rain can cause the river level to rise and to considerably raise the difficulty or hazard level of a particular section of river. Strong winds or tide or heavy surf may make surfing or sea paddling too hazardous. Occasionally a river may be too low to paddle or the surf may be too small. You must respect the advice of the trip leader. Usually an alternative section of river or surf beach will be found if possible, otherwise an alternative activity may be suggested, (e.g. walking, biking, climbing etc).